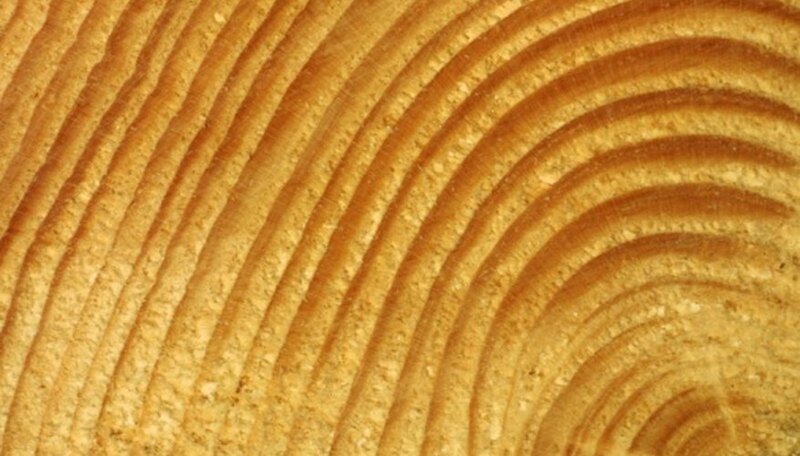 Tree branch slices are cross-sections of branches commonly used as coasters, plaques and for other decorative purposes. Though you can apply paint directly to a bare tree branch slice, the finish rapidly will peel away. Like all types of bare wood, tree branch slices ultimately will reject paint unless they're pre-treated with an adhesive base primer. If you've cut the slice yourself, preparation will prove relatively brief; however, if you plan to paint a decorative tree branch slice already finished with stain and/or sealer, you'll need to take extra measures to strip down this existing finish, or long-term adhesion will prove impossible. Let freshly cut tree branch slices dry for no less than six weeks. Do not attempt to paint a freshly cut tree branch slice, or the moisture within the wood will cause poor adhesion. Sand finished tree branch slices with 60-grit sandpaper until the shiny, clear varnish topcoat appears dull. Skip this step if the slice is unfinished. Smooth the tree branch slice by sanding it with 120-grit sandpaper. Wipe down the tree branch slice with a tack cloth. Do not skip this critical step, or sawdust will prevent the bonding base from sticking. Place the tree branch slice on a canvas drop cloth. Never use plastic drop cloths for this type of project, or paint might puddle. Coat the tree branch slice with the right type of spray primer depending on the wood's condition. Use acrylic spray primer on bare slices; use shellac-based primer on stained slices. Encourage professional-looking results by applying a thin coat and maintaining 8 inches between the tree branch slice and spray tip. Let the slice dry for three hours. Coat the primed slice with acrylic spray enamel. Apply a thin coat and maintain 8 inches between the tree branch slice and spray tip. Let the slice dry for three hours. Add painted acrylic enamel designs and patterns if you wish, using craft brushes. Let the finished tree branch slice dry for three hours. If you plan to use the tree branch slice as a plaque or sign, you can use a stencil to create sharp, attractive letters and numbers on the wood.